Everything you need to know about the Fort Wayne Children’s Zoo in Indiana. See why it’s always voted one of the top Fort Wayne attractions! If you’re looking for things to do in Fort Wayne with kids, we definitely recommend taking them to the Children’s Zoo. Actually, even if you don’t have kids, we still think this is a fun place to go. It is considered one of the top Fort Wayne attractions and has continuously received accolades and awards like the “Top Ten Zoos for Kids” by Child magazine. The Fort Wayne Children’s Zoo exhibits are home to over 100 animals. In total there are five exhibits: Australian Adventure, Indiana Family Farm, Central Zoo, Indonesian Rain Forest, and African Journey. We liked the layout of the zoo and felt like every exhibit was easy to get to. If we had to pick a favorite exhibit (though that is a tough decision to make), it would be the Australian Adventure exhibit. You can walk inside of the Eastern Grey Kangaroo’s enclosure!! It was amazing to be able to see them so close as they lounged and hopped around. Of course, there are zoo employees making sure both the kangaroos and guests are safe. You can see a video of the kangaroos, and some of the other places we visited while in Fort Wayne, by checking out our highlighted Instagram Stories. But really, there are so many animals that we’re sure it’ll be hard for you to pick a favorite exhibit as well! It seems like there is always something going on at the zoo. Fort Wayne Children’s Zoo events include many free activities for kids like “Storytime @ the Zoo” where an animal-themed story is read and kids get to sing and see a demonstration of one of the zoo’s animal ambassadors. There are also events for adults, like Zoofari (previously known as Zoo Brew & Wine Too). You have to buy tickets for this event, but proceeds go to support zoo operations, conservation, education, and animal care programs. With your ticket, you get to sample food, beer, and wine from local and regional businesses. All while listening to live music from local bands and admiring the zoo’s animals. Sounds like a great night to us! The Fort Wayne Children’s Zoo is a seasonal zoo; they are closed from October to April. Exact dates vary from year to year though. During the months they are open, zoo hours are from 9am to 8pm, with last admission being at 7pm. Occasionally they may close for a day in preparation for an event. We think it’s always a good idea to check ahead of time to make sure they are open on the day you want to visit. Babies 1 and under get in free. We asked if they offered a military discount, but they don’t. They do, however, have a “Military Day” on Flag Day (June 14th). On this day, all military (both active duty and veterans) get in for free along with their immediate family. Buddy having fun at the Fort Wayne Children’s Zoo! – There are “Keeper Chats” throughout the day to learn more about specific animals. – There are rides and animal experiences that must be paid for with tokens (token machines are located throughout the zoo). – There are restaurants and cafes throughout the zoo. – You can bring in small coolers, however, no glass or alcohol is allowed. – All parts of the zoo are wheelchair accessible. – Strollers and wagons can be rented just inside the zoo entrance. – The zoo is smoke-free. That includes e-cigarettes and nicotine vaporizers. 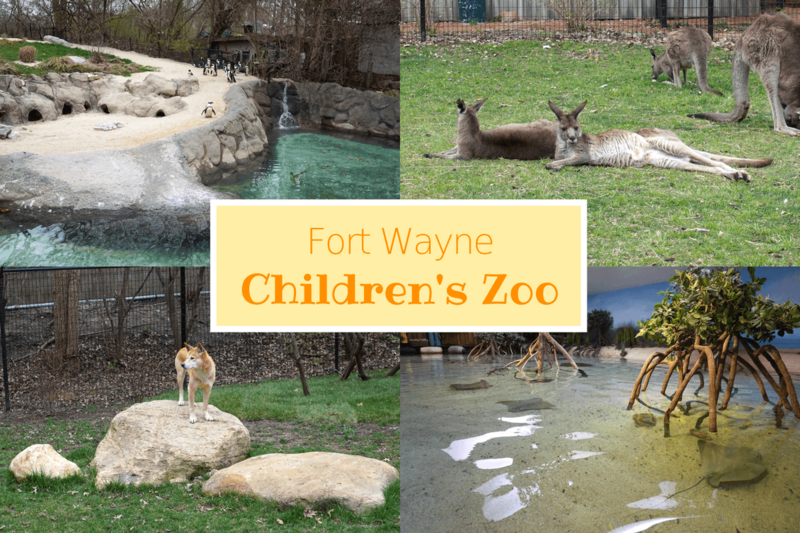 There are plenty of fun things to do in Fort Wayne, Indiana and we think visiting the Children’s Zoo is one of the best. The exhibits were well taken care of, the staff was friendly, and the prices weren’t outrageously expensive like some other zoos we’ve been to. Overall we thought it was a wonderful zoo! I have visited many zoos thanks to my son’s love for the animals. He would dearly love to see those Kangaroos and Penguins. He loves them ever since he came back from down under! I loved visiting Australia and interacting with the various Marsupials so I can understand the Australian Adventure being your favorite part. Penguins are so cute – I love seeing them up close too. It’s great that the zoo offers Adult programs with learning. Nice blog. I love zoo’s generally and where ever i go I’m trying to visit local zoo. This one in Indiana looks interesting, with animal diversity. Keep writing good blogs. I love visiting zoos and this one looks wonderful with beautiful environments for the animals. It looks perfect for kid friendly places to visit. Fort Wayne Zoo seems likes it’s still at a very friendly size. I love it that they have free parking and allow you to bring in your own cooler. Buddy looks like he is having fun on the train. I do love great zoos. This makes me wish I had little ones to run around Fort Wayne with. Zoos are great learning experiences and I’m sure the Keeper Chats are popular. I try to add a zoo to the city itinerray where possible since my daughter loves them. This reminds me of Berlin Zoo which was one of the best I have been to. That toy train is a nice touch for younger kids. I love zoos and I love taking my nephew with me. Im sure he will love it here, too! Of course, kangaroos will easily make it to the top of my list, but the Dingo is a close second! Cant wait to visit Australia! Not yet! Fort Wayne Children’s Zoo looks and sounds fantastic. I have children, but visit even without kids. With over 100 animals, diverse exhibits, and reasonable prices, I’m not at all surprised to learn that Fort Wayne Children’s Zoo is an award winner! Children Zoos bring back old days. Your post made me to take my kid to a zoo right away. Good to know so many interesting facts about Fort Wayne Children’s Zoo which makes it Top attraction and top 10 zoos for kids. Loved the shot of Black Footed Penguins.